Forget those dingy bowling alleys and concrete “family entertainment centers.” Toss away those cardboard party hats and worthless skeeball tickets. At Field Station: Dinosaurs we’re saying good-bye to boring, uninspired birthday parties and inviting your child into an outdoor Paleozoic world of mystery, learning and unforgettable thrills. Every party includes admission to the Field Station and its dramatic dinosaur-lined trails, a knowledgeable party planner designated to your group and VIP seating at The Feeding Frenzy. Each birthday boy and girl gets a photo opportunity with the mighty T-Rex and a special hat to remember his or her incredible trip back in time. All guests receive an age appropriate gift as a thank-you for sharing this special day with your child. The number of birthday parties is extremely limited, please call 855.833.3466 to check availability. A minimum of 15 guests is required to book a birthday party. PLEASE NOTE: We are an outdoor exhibition. Party spaces are located in tented areas and are held rain or shine. Without a birthday reservation through Field Station: Dinosaurs, we do not permit cakes, party decorations, etc. to be brought into the park. For more information, call 855.833.3466 or email ksgroups@fieldstationdinosaurs.com. Concession items available at additional cost – 10% discount if pre-ordered. Fun and Frugal! Save over 25% off our regular ticket price! Add Jurassic Golf for $5 per guest. The Full Field Station Experience and our biggest discount! A $700 Value for just $400! 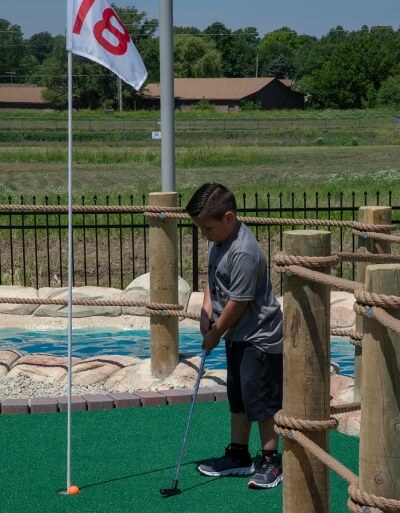 Dinosaurs, fossils and miniature golf! Add Paleontologists’ Laboratory for just $5 per guest. Birthday parties require a minimum of 10 people. This count includes adults and children. Children younger than 1 years old are not included in this count. Final attendance must be confirmed 48 business hours in advance of your party with the Group Sales Department. Please email ksgroups@fieldstationdinosaurs.com. Outside food may be brought into the Picnic Pavilion but not into the park, unless you have booked The Cretaceous birthday package, held in the VIP Tent. No coolers are permitted in the park. Field Station: Dinosaurs is not responsible for lost or stolen items. Because you have a designated time for party events, it is required that you arrive 30 minutes before the assigned party start time for any setup you may require. You will have access for setup via the East Service Entrance, conveniently located near the Picnic Pavilion and/or VIP Tent. Final payment must be made at the Box Office upon your arrival and prior to your event. A credit card will be held at the box office until the end of your party. We are an outdoor exhibition. Party spaces are in tented areas and are held rain or shine. On rainy days, all group members will be provided with a free poncho and the activities will be moved to covered areas. Gifts and food must be removed to your car immediately following the conclusion of your party. Reserve your Birthday Party today by emailing ksgroups@fieldstationdinosaurs.com or calling 855.833.3466.